We’ve been home for a week now. Will it always be so weird to return to our own home after an extended vacation? Can’t remember where to find things, and it seems like we’ve got enough crapola for a dozen people. My to-do list is two pages long already. Trying not to sweat the small stuff, but omg…..everywhere I look there’s something yelling for attention. The really good part about getting home now is that when we pulled into our tree-lined street a week ago, the trees were bare. Tonight, after a week of unseasonably warm temps and sunshine, everything is bursting with color. Of course, we’re taking full credit from friends and neighbors for pulling the nice weather in with us. Most of our attention this week has been to cleaning the Fireball and repairing all the stuff that we broke or that otherwise ceased functioning while we were gone. For those of you who are camp/small trailer enthusiasts – here’s a list and photos of some of the stuff we’ve done since we left in January. Standard sewer hose holder is a big improvement. 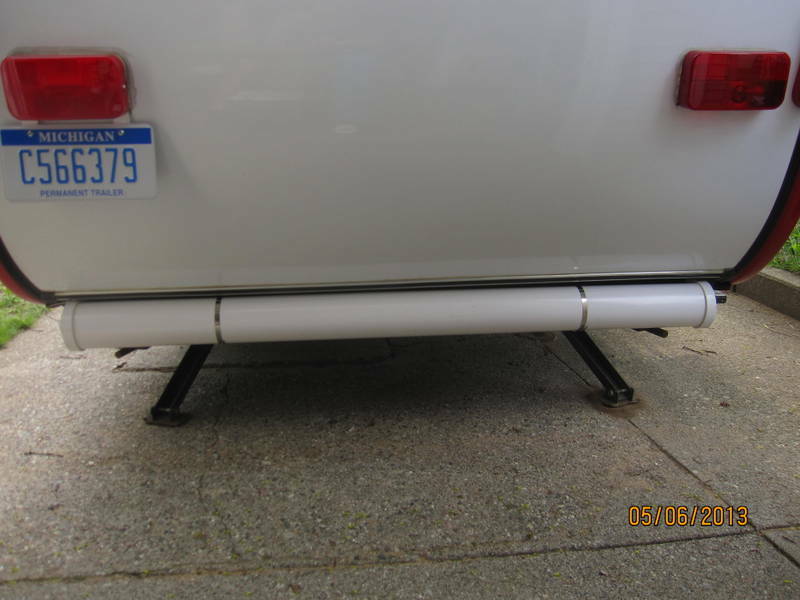 And, in case you’re wondering, we have a new taillight lens for the right side (not installed yet) We had to replace the left one, and it’s so much brighter than the old one….we just had to upgrade the other. 2. 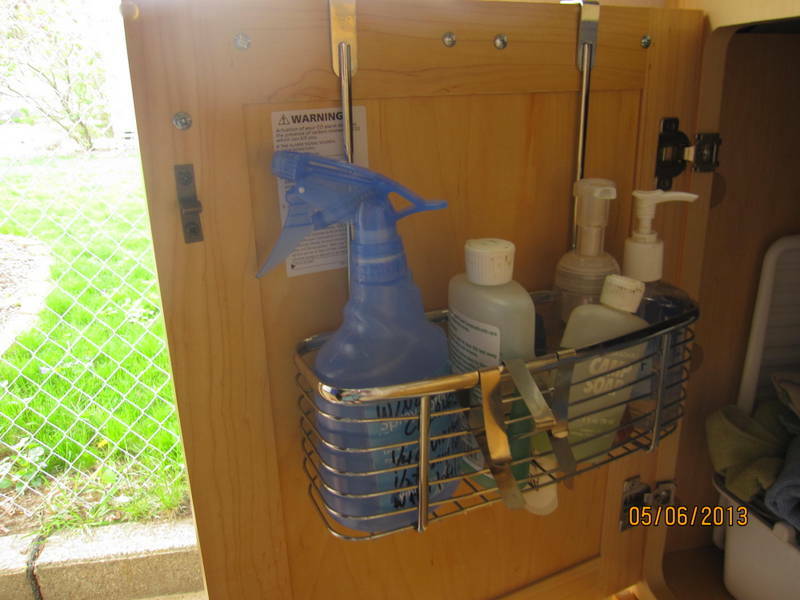 Spray bottle holder. These just rattled around in the cupboard, and it seemed like we had a lot of wasted space. Like being able to open the door and grab soap, cleaner, hand lotion, and window cleaner. Inexpensive over the door holder. Probably came from Target or Camping World. 3. Silverware holder. 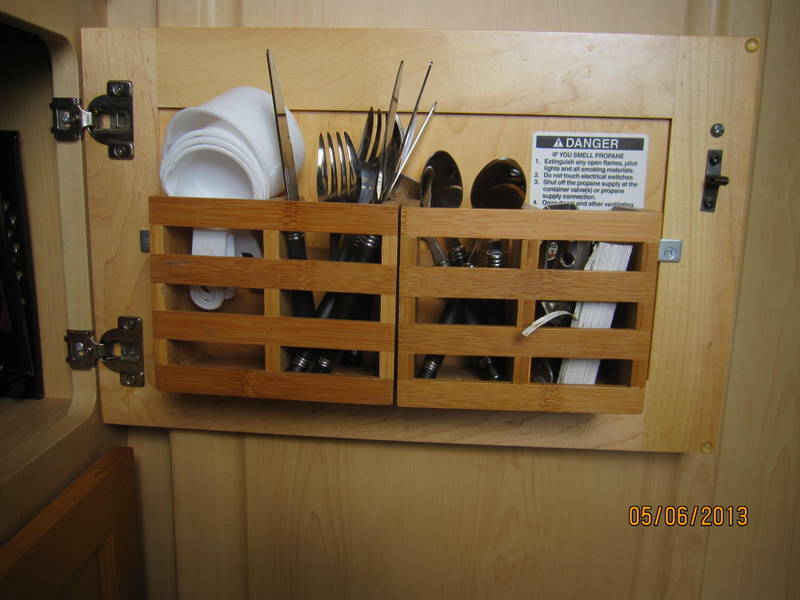 This isn’t quite right yet, but is a big improvement over having the utensils in a flat box in the cupboard. These two holders are screwed together. Came from Bed Bath & Beyond. So nice to open the door and grab a fork. 4. Bookshelf. A couple of screwhooks and two bungies. We store our maps and books here. Prior to doing this, we were moving these items around the few flat surfaces in the Fireball constantly. 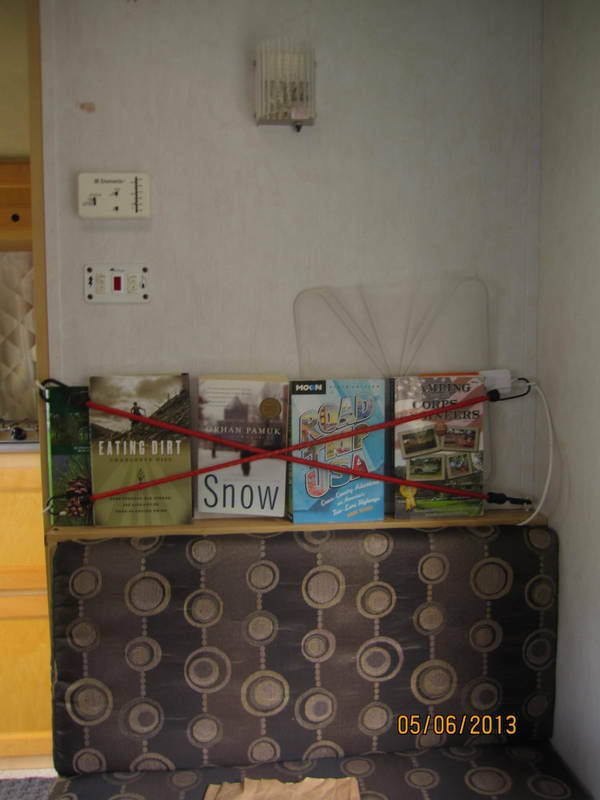 This narrow ledge on the back of the dinette is perfect to store books & maps. We can get eight books easily tucked in. In the above photo, you can also see our digital TV antenna. Stores easily here, and the cable is hidden behind the cushion. As for the antenna, it works great when we’re camping in an urban area, but don’t have any cable hookup. Out in the boonies, it rarely pulled in even one channel, and a couple of times we were able to get a single station. We had so many days where we camped and had zero phone, zero internet connection, no radio, and no TV. (Every now & then I HAVE to know what’s going on out in the world). 5. Utensil holder. This little wire holder from Target is screwed to the wall with a little clip. We love having stuff like this handy. Out of the way, yet handy. 6. Hat hooks. 3M easy-stick hooks. 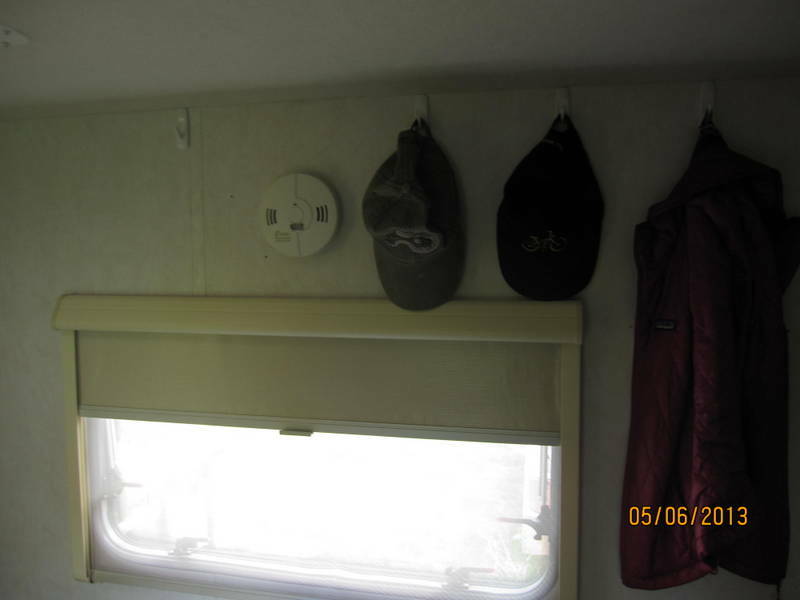 We originally put them up as a place to hang hats, but added more to hang up bulky items that we were using every day in cold weather. Down vest. Fleece. They were alongside the dinette, but not in the way at all. We just didn’t have any other place to put stuff. Unused space above the window is great for hats. Bulky stuff hangs on sides. 7. Coat/broom hooks. All outerware hangs here. We also have clamps for the broom, (which gets used a lot!). Truck keys are on smaller hooks at the top, and Jezzy’s leash is also always draped over another one of the hooks with jackets. Nice to have jackets and leash right by the door. 8. Bathroom latch. Sounds crazy, but our bathroom door is very heavy, and doesn’t stay closed when we’re on the road (in fact none of our doors do). 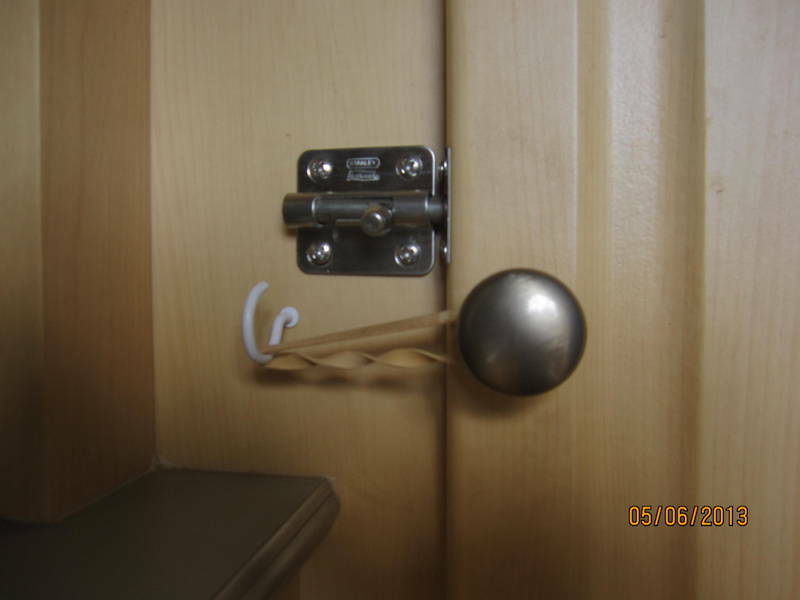 We’ve always just rubber-banded the handle to a little hook alongside the door when we’ve moving, and it’s been okay. Our last leg home, however was different. When we opened up the Fireball, the door had been jolted enough that it pulled the hinges right out of the door, which was laying on the floor. Now we can bolt it for travel. I never want to open up the door and see THAT mess again! New bolt is much better than old rubber-band & hook. We rubber-band other door handles together to keep them from springing open on the road. John was able to repair our hot water heater without RV dealer assistance. On a whim, he looked on u-tube for a repair video. Sure enough, he was able to find a video referencing our specific model, and the person filming the video went thru three or four steps (Try this…Does it work yet? OK, try this…does it work now? Bingo!) You gotta love u-tube. Figured that saved us a couple hundred dollars! Works still in process? We blew up our microwave in the “enchilada incident”, and have decided not to replace it. We had removed it, and used that space for additional storage. I want a drawer that slides out. We used the space for bread, chips, crackers, etc. Don’t know how we would get along without the extra storage. We also are re-designing our dish/pots & pans cabinet. It’s a mess. Trying to figure out how we can make a pull out, two-layer rack. I’ve got a clever brother-in-law who we’re going to tap for this project. Can’t wait to hit the road again. Fireball going back into storage tomorrow until that time. Out of sight, but not out of mind…. 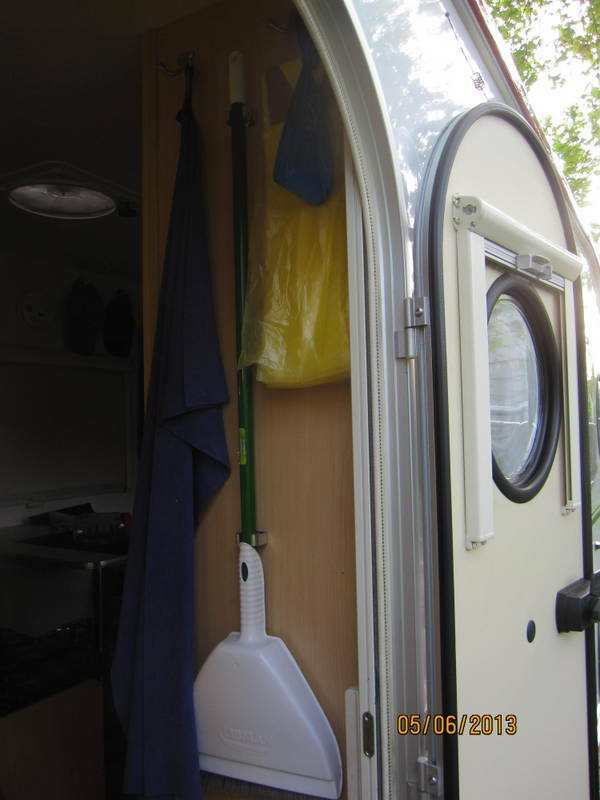 This entry was posted in books, RV life, simple camping, T@DA and tagged camping, RV life, simple camping, T@DA by Judy Crankshaw. Bookmark the permalink. Love your blog & tips! Great Ideas! I am sure I will be borrowing some of these. We also don’t have a microwave so we can use the area as a pantry. We do fine without it, but sometimes I do miss having one. Usually to warm up a cup of cold coffee. But the space is more important to us, too. It’s always changing. We’ve found that what works for a few days camping doesn’t work long-term. We’re trying to optimize for the long-term. Hi! My husband and I are looking into buying a 2010 T@DA but are somewhat weary about it because of the fact that they are no longer being made. Have you had any issues with yours? I want it SO badly! I just don’t know if it’s a wise decision (or a bad investment). Any feedback would be FANTASTIC! Thank you! Issues? Not really. We did have to replace the inverter, but that wasn’t such a big deal. We really don’t know the history of the Fireball, since we bought it off a crappy little consignment lot in AZ last spring, but we’ve not had any BIG things go wrong. We LOVE this trailer. One thing we did soon after purchase was to replace the sleeping cushions with a real mattress. ZZZzzzzz soundly. We have a small solar system we use to keep our battery topped off, and have added a second battery. John refers to the Fireball as his “hobby”, loving to tinker and make little enhancements that make life easier. We wouldn’t trade the T@DA for any other trailer of this type that we’ve seen, and we’ve looked at a lot. Buying a used T@DA is probably always a risk, but guess you just have to use your best judgement, then take the leap. Hope you find one that suits you. Maybe we’ll meet up at a T@B/T@DA rally somewhere. Reviewing some blog things and just saw your comment (admit that I may be somewhat technologically stunted). We don’t worry much about the fact that T@DAs aren’t made anymore. The components – refrigerator, fan, stove, etc. Are all made by companies still in business. We’ve found a local RV dealer to work on brakes, bearings or whatever. To us, the manufacture issue hasn’t had any impact. Again, sorry for the months delay in answering. Guess there are a bunch of comments/notifications I’ve never seen before. Good luck with your camper purchase. They are all fun. You can’t be too organized…especially in our small spaces! 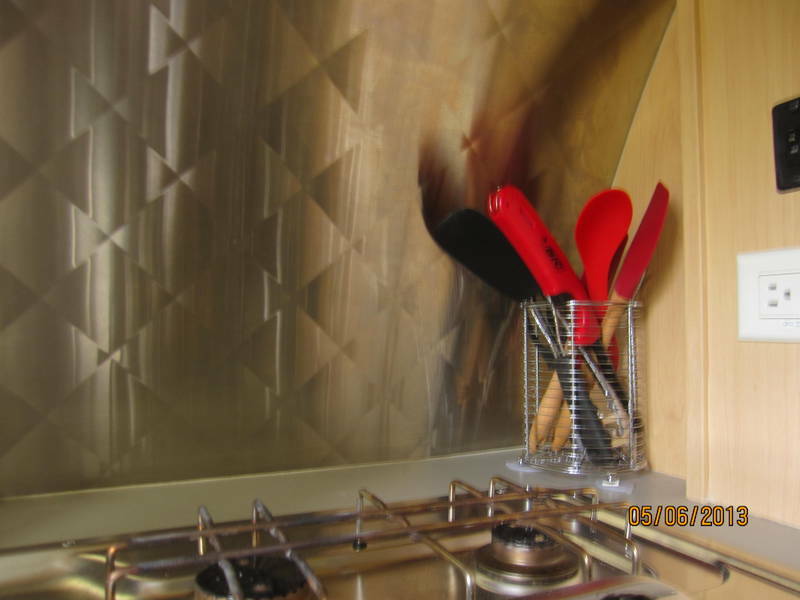 Loving your sheet metal backsplash and so thankful to 3M! We have the space for the microwave and opting not to purchase…after we get our feet more wet on the road…I’ll have to see what my cooking appliance choices rally towards. Sure I’m going to miss my oven but hopeful I’ll come up with other creative choices. Glad your home safe and sound…MI one of absolutely favorites states ever! In the year we’ve had the Fireball, I think we only used our microwave a couple of times, one of which resulted in the ‘enchilada incident’. We find that we’re rarely plugged into shore power so it makes sense for us. Your blog is awesome – can’t wait until you hit the road. When you wander into Michigan, make sure to be in touch.